Cat Kitten Grey Carpet Scratching Post Toy Elastic Pom Pom Paw Print 18" X 13.5"
The Ripple Rug is a First of its Kind Invention. 'Made in the USA'. Watch Our 60 Second Video of the Ripple Rug in Action. See the Ripple Rug in Action. What is the Ripple Rug?. Scratching Rug and a Warm Cozy Bed All-in-One. Sticky Paws is ineffective on surfaces treated with non-stick and/or stain-repellent products, such as Scotchgard. Manufactured from inert and non-toxic materials, the one and only Sticky Paws! ® is specially formulated to have just the right amount of tactile feel cats can’t stand. Essential for any healthy, well-adjusted cat. Check out our over extensive amountof. Check out our Large selection of categories for Dogs, Cats,Birds, Reptiles, Fish and NOW Farm pets. CAT FURNITURE/PENDULUM WITH POM POM AND EMBROIDED CAT LOGO. Cat Kitten Blue Carpet Scratching Post Toy With Fur Mouse On Elastic 19" X 14"
Made of wood this cat scratch square is sturdy, durable and attractive to cats and owners alike. The new and exclusive Deluxe 3 Tier Cat Scratcher from Swell Pets is a complete activity centre for your cat. Covered in soft, cream fabric, the Cat Scratcher will look great in any decor. Simply wipe clean to remove any smudges from play. Ware Kitty Cactus With Toy 24"
We call this the kitty couch. REAL WOOD and Premium carpet. Hand made pet furniture. Captain Catnip approved! You can choose your color if you like. 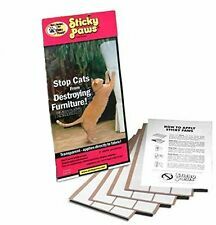 Help keep cat's off of your furniture with Sticky Paws transparent sticky tape designed with a tactile feel cats avoid. Sticky Paws also helps control inappropriate elimination. This tape is medical grade adhesive and safe for pets and most furniture. This product is easy to apply and remove. Keeping your cat's claws in check is very important. Cats have a need to sharpen and wear down their claws and if you don't provide them with a toy on which to do this you may find the resultant scratches on your furniture! 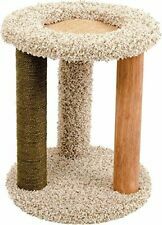 PawHut Cat Tree, Scratching Climbing, Pet Toy, Kitten Scratching Post/Tower New. Its made of high quality bamboo fibre board with a 420g/㎡ plush material covering. 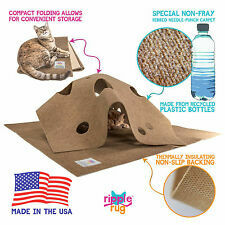 It’s a great item for your pet to explore and have fun with. Cat can sleep on top bed. There is a hanging toy for playing. Cat Kitten Red Carpet Scratching Post Toy With Fur Mouse On Elastic 19" X 14"
Cat Kitten Beige Carpet Scratching Post Toy With Fur Mouse On Elastic 19" X 14"
Carpeted climbing tree for cats or kittens. Allows pet to naturally scratch, climb and simply lounge around. Easy to assemble. Fits ceilings up to 9'. a safe place for your cat to climb and observe. 'Super-stable large cat scratcher with two hanging toys!'. Spare scratching belts available. The two-tier play station is the perfect place for your cat to climb and explore. With the cream, plush covered base providing a steady footing for this good-sized activity centre, your feline friend can choose from several activities, and distractions, to make sure they stay active and stimulated. 'Super-stable large cat scratcher with two hanging toys!'. Spare scratching belts available. Heavy carpet covered baseboard. And it removes just as quickly for a simple No-Goo solution. The No-Stick, No-Scuff design works without adhesives so it won't stick to carpet or scratch wood flooring - and pet hair wont' stick to it. "SmartyKat Scratch 'N Spin-11""X11""X20""". Worldwise-SmartyKat Scratch 'N Spin. Dangling toys attract cats to play and scratch! The wands spin freely with the flick of a paw. Product images are for illustrative purposes only and may differ from the actual product. Great fun for all my feline friends - Tilly. Approximate size: 20 x 7cm. A perfect toy for your feline friends. If There Is A Delay Be Assured That We Are Not Ignoring You, We Will Answer You As Soon As We Can. 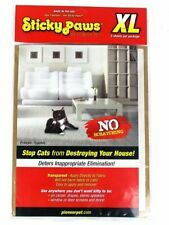 Hours of fun and exercise for your cat. Strong carpet base. Best gift for your cat. WE ARE HAPPY TO HELP RESOLVE THE ANY ISSUES.